CORVALLIS — It was back on May 30, 2017. 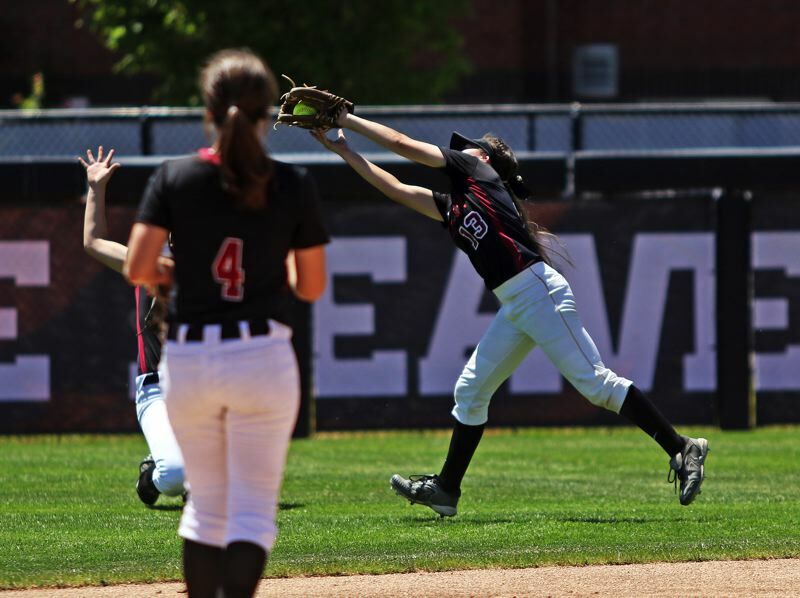 Players on the Tualatin High School softball team stood on the field at North Medford High School, some wiping away tears while feeling the hurt of a hard-fought, down-to-last-inning 4-3 loss to the Black Tornado in a Class 6A state playoff semifinal game. It was a loss that definitely stung for the Timberwolves. But, more than a year later, and 30 games later, Tualatin hasn't felt the sting of another tough loss — or any loss, for that matter. The Wolves, maybe spurred on by last year's heart-breaking setback, responded with what easily could be considered one of the best softball seasons in Oregon high school history, if not the best, going 30-0 and capping things off with a 4-3 come-from-behind win over Clackamas in the Class 6A state championship game, played Saturday at the Oregon State University Softball Complex. "Last year, after losing in the semis, we had a bone to pick with everybody," said Tualatin senior Ella Hillier, who scored the game-winning run in the bottom of the seventh inning in Saturday's state title tilt. "We got through preseason, and we got through league without losing, then we started thinking 'we can do this, because, now we can't lose.' After we got through league without losing, undefeated had to be the goal." "That's such an accomplishment for us," Tualatin senior outfielder Zoe Olivera said. "To know that we beat every single team that we've come up against, it's just crazy." 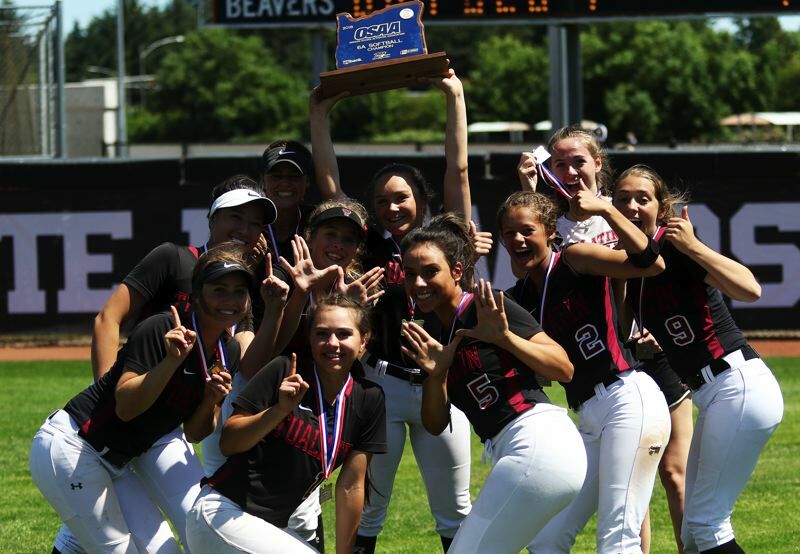 In going 30-0, Tualatin became the first Class 6A softball team go unbeaten in a season since the OSAA expanded competition to six classifications back in 2006-2007 school year. The Wolves also became the first "big school" to go unbeaten in a season since Churchill won the Class 4A state title, while going 23-0, back in 1992. And, to cap things off, as of May 31, Tualatin was ranked No. 8 in the country in the USA Today Super 25 softball rankings. "Being undefeated, it's a shock. It's unheard of," Tualatin senior outfielder Kayla Laird said. "It took a lot of heart, and a lot of effort." Tualatin had some close calls during the regular season, getting a 5-4 win at Sunset back on March 26 and posting a 2-1 home win over Canby in Three Rivers League play on April 21. But the unbeaten streak was really put to the test back on April 18, when the Wolves faced rival Tigard in a Three Rivers League game played at Tualatin High School. In that contest, Tualatin senior Megan Woodward and Tigard senior Ashley Davis locked up in a pitchers' duel, resulting in the teams going into extra innings in a scoreless deadlock. The Wolves ended up winning that game 1-0, with Hillier driving in sophomore Sydney Wagner with a squeeze bunt in the bottom of the 10th inning. At that time, being undefeated was something that Tualatin team seemed to thrive on, no matter what others may have thought. "It's crazy," Laird said. "Everyone was saying, 'oh, you just have to lose one to get it over with.' We were like, 'no, we're not going to lose.'" In the Class 6A state playoffs, Tualatin had to come back from an early 1-0 deficit to get an 8-5 win over Oregon City in the semifinals. Then, in Saturday's state championship contest, Tualatin had to rally after trailing Clackamas by scores of 2-0 and 3-1. The Wolves ended up getting the winning run, wrapping up the undefeated season, when freshman Taylor Corcoran singled in Hillier in the bottom of the seventh inning. "I know, for sure, coming into the season, I didn't think we'd be undefeated," said Tualatin junior Emily Johansen, who hit 16 home runs on the season, including a two-run, game-tying fifth-inning blast in Saturday's title game. "We've never done that before. This is incredible. It's an amazing feeling. It's crazy." "It took staying together, staying bonded and never giving up," Laird said of the key to going unbeaten for the season. "Everyone said we'll go 29-1, but we had to come out, knowing that people wanted us to fail, but we showed everyone that we had the heart to do it."